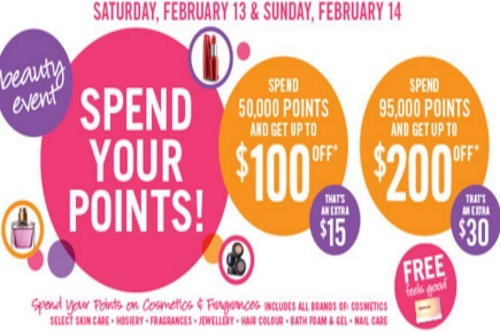 As we reported earlier, this weekend is a Shoppers Drug Mart Spend Your Points Event! Redeem your points on beauty products, this applies to cosmetics and fragrances only including all brands of cosmetics, select skincare, hosiery, fragrances, jewellery, hair colour, bath foam and gel and nail care. Spend 95.000 points and get up to $200 off (Extra $30). Offer is valid Saturday, February 13-Sunday, February 14, 2016.